Puggi is our breakthrough Gelato Mix base. Developed and manufactured in Australia, this product makes a hard ice cream with all the quality and taste you expect from European sourced materials, but at an Asia-Pacific cost. This huge saving allows our customers to keep the profits they need to fight against the rents and costs of the retail environment, and to compete with the 'big boys'. Our gelato compares very well against the best brands in the market for taste and quality. 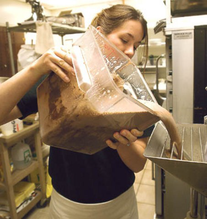 No need for pasteurisation - just add warm water to the ice cream powder, mix up and put straight into the machine. You will be delighted by the results - we use the best dairy raw materials from New Zealand and Australia, and work according to the strictest Australian food standards. The factory is supplier to KFC, Jolibee, Burger King and many others.